“Meet ‘drone-vertising’, a new media format taking advertising to a higher level,” the voiceover continues. The video comes from Hungry Boys, and shows how its invention, drone-vertising has been used to reach busy professionals in office buildings who often skip lunch. And they’ve been generously open about how their invention works. The formula is simple: brand + drone + sky = drone-vertising. Game-changing. To be fair, the agency also has more serious cause work in its showreel, such as campaigns for domestic violence, endangered animals and road safety. And while we can laugh at drones carrying posters flying around office buildings, it did work, says Hungry Boys. 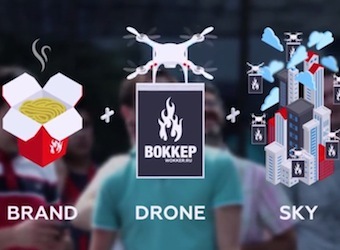 The activation was for Wokker, a noodle chain, which saw sales increase by 40% while the drones were doing their thing.